On November 14, Kyiv hosted the Festival for small business, Get Business Festival 2018, which attracted more than 3,000 entrepreneurs from all over Ukraine. 80 speakers on 8 streams talked about business growth, personal effectiveness, motivation, finance, HR, marketing, PR, women in entrepreneurship. 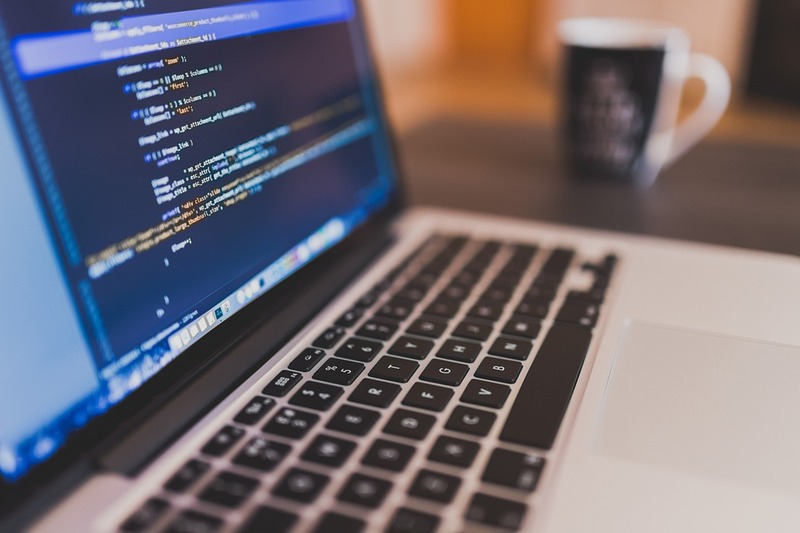 It is important to note that the latest technology plays one of the most important roles in the development of small businesses. Representatives of bvblogic this year decided to take part in the festival and share their experience in innovative technical solutions for business development. 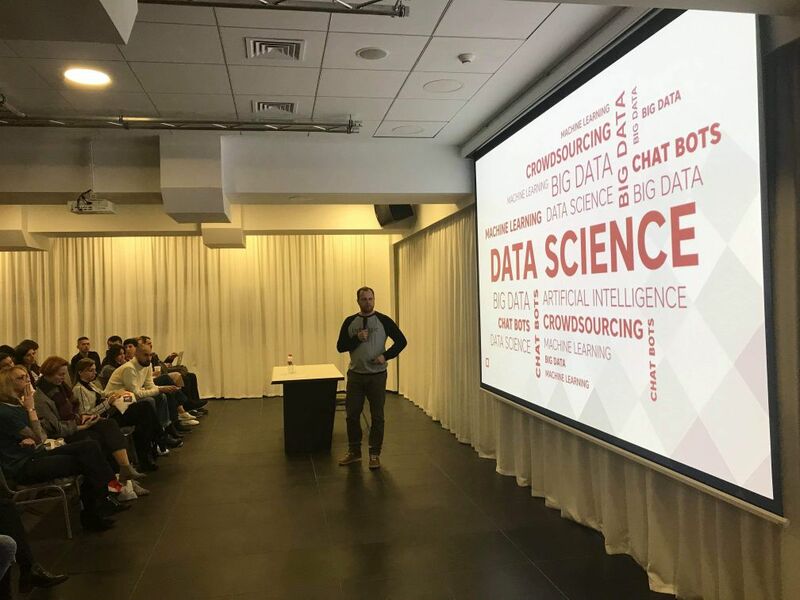 Vitaliy Rodimyuk, CEO of bvblogic company, spoke in the “Marketing and PR” stream, where he described the use of trend technologies for marketing purposes, creation of new channels of communication with target audiences, and simple ideas for business dedication. 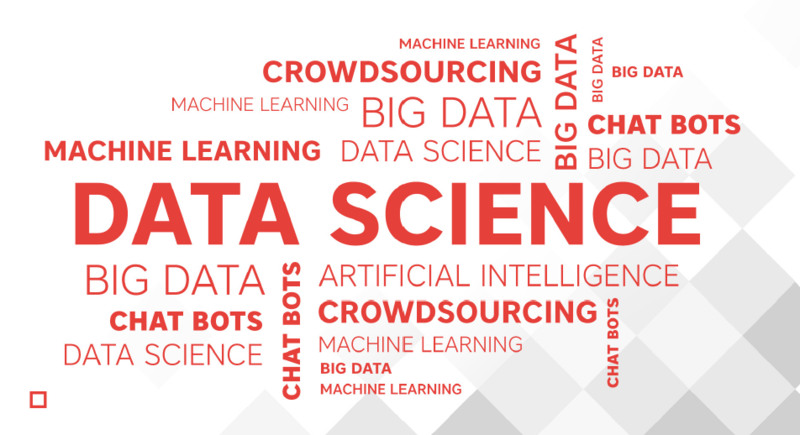 Words such as Machine Learning, Artificial Intelligence, Data Science, ChatBots, Big Data – are familiar to everyone. Today these technologies are very actively used by IT companies and they help to solve extremely interesting business tasks. How exactly – let’s look at a few practical cases. Image recognition technology can engage new customers for the company that sells, installs, and services solar panels. The project was developed for a large American company that manufactures solar panels for the public. The project’s objective was to find out the locations and contacts of potential customers who could be offered solar panels, as well as existing users, who may require service or maintenance for their installations. To solve this problem, image recognition technology, namely, satellite image recognition, was applied. A neural network was created which had been analyzing a certain set of parameters that determined where the solar panels are located and where they are missing/could be installed. These indicators included rectangular surfaces, which in some way reflect the light placed at some angle. The information on the availability of solar panels was associated with locations, addresses, and thus, a pool of contacts was formed, and the company could continue to work with this data. At some point, an error was detected in this system – it identified both solar panels and other similar objects, such as swimming pools. Looking at this bug from another perspective, we realized that this is in fact an additional opportunity. 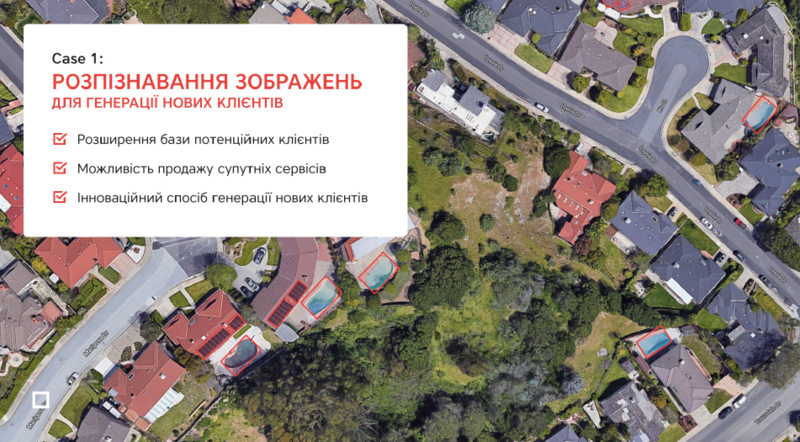 After filtering out the results, we also received a contact database of people with swimming pools, and this information could be used by pool maintenance companies. The Analysis of behavioral data to increase customer loyalty. How was it done? At first, it was necessary to gather a large amount of information about the behavior of people on the site. We traced how people browse the site, where they go and where they do not look, what they are used to and what they are not. Then, the segmentation of these customers was begun by the neural network in order to adapt the website and the marketing strategy to specific categories of users. For example, there are users who visit the site to simply find out prices, or someone is looking for promotional products (accordingly, important discounts for them, and promotion can be an argument for buying), etc. – with all of these categories you need to apply a different communication strategy and a different approach. Our system enabled the company to develop an individual approach to communication with each category of users. The use of Augmented Reality to gain and attract more audience. 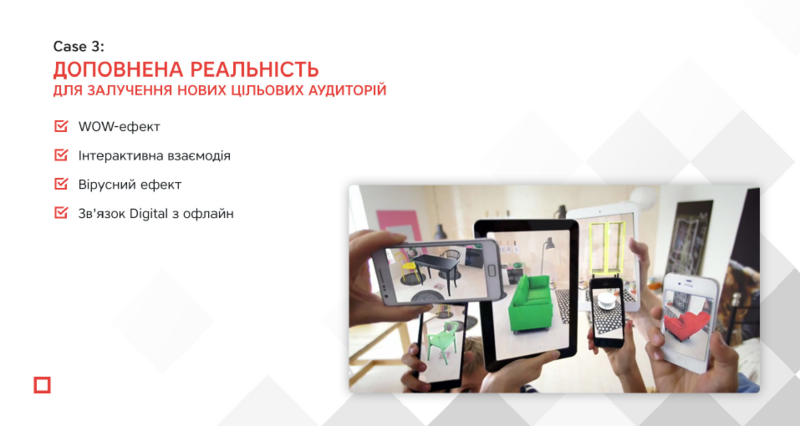 We developed an innovative application for a furniture company. In order to find out how a particular piece of furniture “fits” into the interior, it is very easy and convenient for a user to use a mobile application that allows you to virtually place a sofa or a table, or anything else in your room. The same principle can be used to present the perfect look of a building that is still at the stage of completion or arrangement, or to show the city’s tourists interesting and useful places. There can actually be more examples of how this app can be applied. 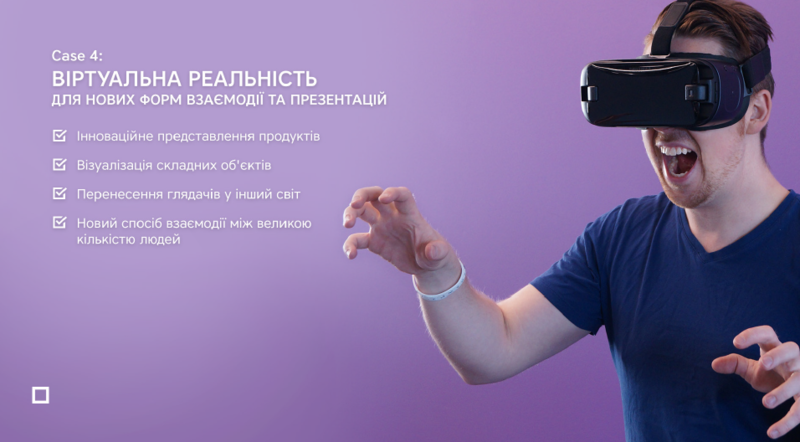 Virtual reality for the new forms of interaction and presentations. a new way of interaction between a large number of people. This tool was used at a large-scale IT conference, where each company had its own corner and sought to introduce itself to as many participants as possible, while young people, students, future developers, etc. had the opportunity to get acquainted with each company and fill out a questionnaire to receive job offers in the future. We decided to organize their participation in this event in a non-standard manner and had created a chat bot that helped us to add some drive to this action. Participants were registered with the bot and had the opportunity to perform various tasks that were regularly sent by the bot throughout the day. For this they got unique coins, which at the end of the event could be exchanged for gifts and awards. This helped us to see the people who were the most active, had an analytical mindset, communicated well in English, and to collect a database of such people. The use of chat bots is very widespread and it helps to communicate promptly and simply with the target audience, whether they are employees of your company or customers or partners. With one of our partners, we decided to find a way how companies (large or small) could solve their marketing tasks more quickly and efficiently. For this, we created a mobile application P.aid (People aid for brands), which solves problems such as mystery shopping, monitoring of the POSM, photo checking of the outdoor advertising, price checking, polls and more. On the one hand, companies have an access to a huge database of performers for their tasks and of the end users, on the other hand, the performers receive a good opportunity to make money no matter where they are or what their profession is. For the company, this allows avoiding the need for hiring and retaining employees, as well as solving tasks that require the presence of performers in different locations. For example, if a company wants to check the price of their product in retail stores, it simply places the task with a complete instruction in the mobile app, the performers take this task and are set to perform it. The application allows you to take a photo from the store with the product and its price and instantly send it to the customer. Once the task has been completed and the customer has accepted it, the performer immediately receives payment on his card, attached to the application. getting results in the real-time. We have recently launched the bvblogic Challenges project, which helps companies to solve their problems or business tasks with the involvement of the ideas from active people who want to take part in solving such problems. Companies have the opportunity to formulate and post their task through a Telegram bot that brings together hundreds of creative and talented people, including participants from various hackathons, startuppers, industry experts, and business analysts. If the participant is interested in the challenge, he or she generates the idea and sends it to us through the bot. All the collected ideas go to the client company, and the company chooses the best solution and rewards the author of the idea with gifts, and sometimes even invites him/her to the implementation of the idea into life. positioning of the company as an innovator in the industry. If you feel that your business needs creative ideas, approaches or you have some unresolved problems in the company and you don’t know where to start, we recommend you to use the bvblogic Challenges – 3 months to generate innovative ideas for your business for free!